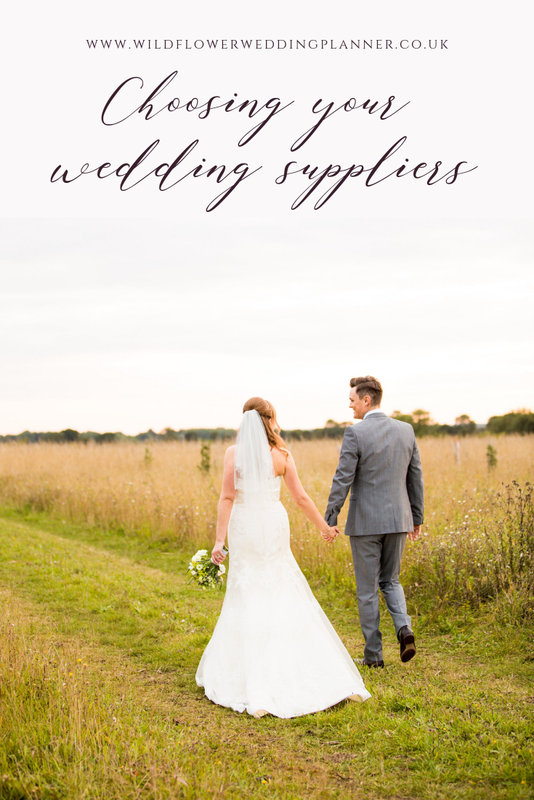 The next step in the wedding planning process is choosing your suppliers. There are so many amazing suppliers to choose from, it can be a little overwhelming when trying to pick the right ones for your special day. However, if you put in the ground work and plan out your budget and pin down your wedding day style, it will make the process a whole lot easier! Whilst it is important to secure your suppliers as early as possible, it is equally as important not to rush in to things. You should take the time to find the suppliers that are the right fit for your wedding day. Panic booking your suppliers can leave you second-guessing your decisions further down the line. Start off by securing your wedding venue; this will mean you have your date and location locked in! Then move on to the suppliers who generally only take one booking per date, such as your photographer, videographer, wedding planner and so on. Once these are sorted you'll be able to focus on your "on-the-day" suppliers such as your florist, caterers, and cake-maker. Further down the line, you can then move on to the suppliers who won't need to attend on the day but still have a timescale to work to such as your stationer. It's best to use a variety of different sources when you are researching your wedding suppliers. These can include internet searches, wedding blogs & magazines, inspiration shoots, wedding fairs, directories and of course, recommendations from family & friends. what style of wedding are you planning? Are you having a casual or formal day? Country chic, modern elegance or industrial vibes? Do the suppliers you are considering compliment your style? Your budget: Are they within budget? It's easy to get carried away but unless you have an unlimited budget, overspending in one area will mean you'll need to cutback elsewhere. Location: will they travel to your venue? Are there additional costs you need to factor in, such as accommodation and travel costs? Based on the responses you get to your enquiries, make a shortlist of 2-3 suppliers that you love for each of the categories. For some suppliers a phone conversation, or even just email conversation will be enough for you to get a feel for whether or not you'd like to work with them. For others, like your photographer and wedding planner, it's important to check your chemistry. You want to make sure you have a good rapport with them as you will be spending a lot of time communicating in the lead-up to your big day, and in their company on the day itself. Try to meet up in person if locations allow, or at the very least have a video call. Once you've narrowed down your shortlist, take a closer look across all of their social media accounts. Check out any reviews they may have, and have a good look at their website if they have one. Trust your gut instinct, and then make your final decision! Now comes the fun bit of actually confirming and booking your chosen supplier! Check over their Terms and Conditions thoroughly and make sure you're happy with what is included. Don't be afraid to ask questions if there is something you are unsure about - now is the time to iron out any potential issues. It's a good idea to let the other suppliers that you've spoken with or met, know that you have decided to book elsewhere. This will allow them to reopen up your date to other potential clients and they will really appreciate your honesty - ghosting is not cool! So now you have your main wedding suppliers booked and your big day is really starting to take shape - how exciting! Hopefully the above tips will set you off on the right track, but if you are struggling to find your perfect supplier or need help with anything else, then you might want to take a look at how I can assist. You'll find a full rundown of my wedding planning services right here!